When new, copper is the same bright color as a shiny new copper penny. When first put outside, a copper weathervane will quickly age to a rich chocolate brown color. The transition to a fully turquoise green patina takes a number of years to develop under natural weathering. Copper weathervanes installed in damp coastal or marine environments will develop patina layers faster than those in dry inland areas. The green patina that forms naturally on copper and brass, sometimes called verdigris, usually consists of varying mixtures of copper chlorides, sulfides, sulfates and carbonates. These variations depend upon environmental conditions such as sulfur-containing acid rain. In clean air rural environments the patina is created by the slow chemical reaction of copper with carbon dioxide and water, producing a basic copper carbonate. In industrial and urban air environments containing sulfuric acid from coal-fired power plants or industrial processes, the final patina is primarily composed of sulphide or sulphate compounds. As a bit of environmental ‘magic’ the patina on each weather vane is unique. If you live by the ocean, you will often get a “speckled” patina which is caused by the sea salt in the atmosphere. 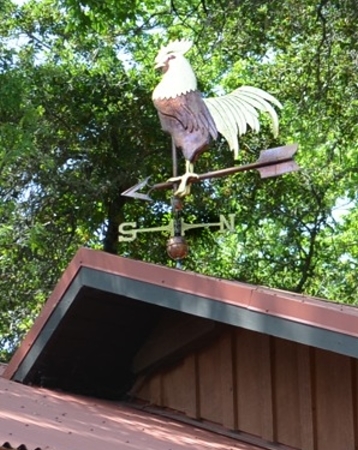 If you live in an area with oodles of rain your weather vane may develop a “weeping” patina over time. 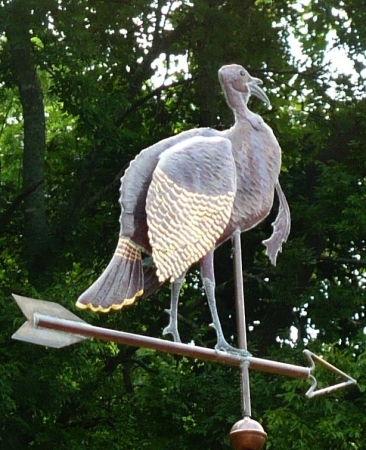 Every weathervane develops an individual appearance based on its location and the environmental factors present. Design and patina are what make your vane distinct from any other. 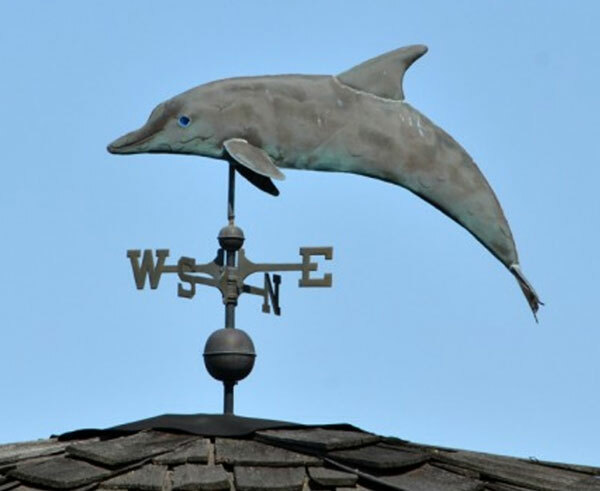 Below is a photo of one of our Dolphin weathervanes. It resides in Anacortes, Washington. Pictured after fifteen years of outdoor exposure, you can see it has begun to develop a nice turquoise green patina, particularly on the underside. A naturally acquired patina is prized by collectors of antique weathervanes. Some of these antique weathervanes have sold for hundreds of thousands of dollars and a prospective customer has to be cautious because there are some unscrupulous artists and metalworkers who chemically induce patinas to simulate antiquity in newly-made weathervanes. On the subject of artificially induced weathering, many of the “patinas” you see on weathervanes imported from overseas are called cold patinas and are sprayed or dabbed onto the vane’s surface. Much of this will wash off with the first few rains. Hot patinas are more long lasting but are applied at very high heat, primarily to bronze sculpture pieces. 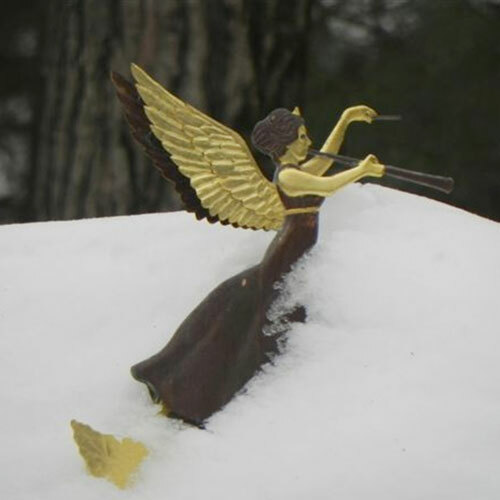 Unfortunately, the temperatures required are so high; they will weaken and melt the solder seams on a weathervane. More sophisticated cold patinas can be professionally applied but the final appearance can not be guaranteed. In addition to the unpredictability of the patina’s outcome, some of the chemicals are toxic to work with, store and dispose of. Because of these issues, West Coast Weather Vanes does not offer this ‘service’.